I'm a huge fan of The Duke. True Grit, along with The Searchers and Big Jake, is one of my favorites (the dolly-in on Ethan's reaction in The Searchers as he enters the asylum and sees the women who have been brutalized by the Comanche has always stuck in my mind). So it was with some trepidation that I went to see the remake by the Coen Brothers (remake isn't entirely accurate. The Coens went mostly with the Charles Portis novel which has a different ending and a different point of view altogether) I just couldn't see anyone taking the place of The Duke in the role of Rooster Cogburn, for which Wayne won his only Academy Award. I was wrong, on many counts. It's good. It's real good. I knew going in that technically, a movie made in the sixties would be inferior to a modern retelling, but in my opinion, everything worked much better. The story flowed much more naturally (as it should if it followed the novel) And of course Matt Damon as LeBoef was light years ahead of Glen Campbell's stilted performance in the original.The star of the show, however is young Hailee Steinfeld as Mattie Ross. No one really liked Kim Darby in the original, but Steinfeld's Mattie Ross runs away with the show hands down. If she doesn't get an Oscar for this one, no one should get one. But enough about the cast. There are more than enough reviews out there to cover that sufficiently. Roger Deakins and company have turned out one of the most beautifully photographed movies I've seen in years. On a crisp digital projection, it's jaw- dropping in places. Dolly Grips Bruce Hamme, and Rick Marroquin did truly beautiful work with sweeping crane shots and understated push-ins. Gentlemen, this is the one we all wanted to work on*. Dollygrippery salutes you. 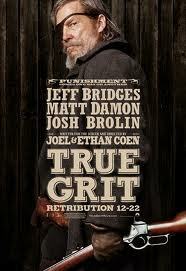 Your contributions helped make True Grit a beautiful piece of work. * A buddy of mine heard that I was working on a Coen Brothers picture at the time this was being shot. After bombarding me with baffling texts wondering if I could help him get a spot on True Grit, I made it clear that I was actually working on a Farrelly Brothers picture, and while I love Bobby and Peter, I would have gladly left for a Dolly slot on Grit. ve done two shows on, that he's having serviced, back. The funny thing is, I m pretty sure I've had this dolly before. Back, long ago when I used to do movies. I remember you number 4*. And now you're mine again. Anyway, I'm beginnig to ramble. But you get the general idea. That being, I made a big deal of insisting to my Chapman rep that I get "my" dolly back, and the temp replacement being better. Anyway. I 'm going to make another drink, so have a good night. See you in Long Beach. I intended this morning to do what I call my "MASR," pronounced like "laser" or "Morning After Sober Rewrite." But, I've decided that the Captain (Morgan)'s writing style has a certain creepy charm that I rather like. The run-on sentences and awkward examples give it a flavor all it's own. So I've decided to leave it as-is, with apologies to Long Beach, Palmdale, NCIS, CSI:Miami, my high school English teacher, and anyone else who reads this random, seemingly pointless post. As most of you know, we have a new addition to our little family. Jackson is now at twelve pounds. As I was sitting on the couch last Saturday with him, it occured to me that he would make a good workout partner. I could do three sets of twenty reps of lifting him straight armed off my lap to just over my head. So I did it. A few hours later, I bent down and turned to pick up something or other and BAM. It was like an electric cattle prod was jabbed into my lower left back. I somehow made my way to the couch after several minutes in a frozen position. There I stayed. For two days. I have now missed two days of work and tomorrow will be my first day back (the doctor told me I could stay out until Thursday, but I think I can make it back tomorrow). I've probably missed ten days of work in twenty years. I hate missing work. I will now have to endure endless jokes and jabs- "You got that old man? "- and, of course next week's check will be a little lighter. I've carried three hundred pound dollies up stairs, lifted dollies onto track, hauled plywood into sets and rarely had a complaint. It took twelve pounds of lift to put me on my back. I blame the boy. As I was recuperating, I had occasion to rewatch The Ring. I saw it in the theatre when it came out and was impressed with the production value, but it soon fell out of my memory like so many things do nowadays (Where are my keys,? where is my car,? Where did I leave the dolly?). Watching it again, I was struck by how well it's made. Forget the story. The Ring kicked off the craze of American studios remaking Japanese horror flicks- The Grudge, One Missed Call, etc., most of which were inferior to the original, and at least one of which, I was Dolly Grip on. The story is implausible at best. The beauty of The Ring is the atmosphere. Every frame is infused with dread. Much like Seven, the rainy, dreary Northwestern American coast is used to full effect. The dolly work by Mike Brennan is beautiful and flawless. You won't see any clumsy crane finishes or bumpy push-ins here. And the dolly work adds to the dread. Watching it for the second time, I was able to see it purely on technical terms. They took a story which they had to know was clunky and made the atmosphere the star. So check it out if you get a chance. Anyway, I'm back to work tomorrow and hope I can fake my way through another day. I Have To See It Once. I did a post a while back for camera operators showing ways that they could help make their Dolly Grip's life easier ( it's here). One of the points I brought up was I have to see it once. I did a show a few years ago where the camera operator would constantly verbally correct the first run-through. As in, "Too slow, too slow." or, "Boom up quicker when he stands, we didn't make it." This nearly drove me insane. Finally, I told him, "It's the first time I've seen it. I know how to do it, I just need to see it once." I think a lot of people don't realize that besides just seeing it, we also have to get the feel of it. We're getting upwards of 800 lbs of dolly, operator, and camera moving and stopping with a person* and often simultaneously booming up or down, and trying to get our timing right as well as hit a mark. Remembering how it feels to do a particular move is often just as important as remembering how it looks. Those first run- throughs are how we learn what is going to be required as far as how much strength to use to get the whole thing going and stopping again. If I'm too slow in one spot on the first rehearsal, that's actually a good thing because it tells me what I have to do to make it work. I can remember how much pull or push I used and tune it up on the next one. The actors always do it differently than the stand-ins. This is one reason that I don't like to do too many rehearsals with stand-ins because the feel of doing it a certain way gets ingrained into your muscle memory and then you have to completely recalibrate it all with the actors. So if the first time with actors is a little off, you don't have to tell me. Believe me, I know when it's off, and where. I'm just figuring out what I need to do to fix it. * Or whatever we're tracking. In the last six months alone, I've had to keep up with an owl, a falcon, several cars, and fire. (yes, fire).